Despite the common belief it is actually possible to access private fields and methods of other classes via Java Reflection. It is not even that difficult. This can be very handy during unit testing. This text will show you how. Note: This only works when running the code as a standalone Java application, like you do with unit tests and regular applications. If you try to do this inside a Java Applet, you will need to fiddle around with the SecurityManager. But, since that is not something you need to do very often, it is left out of this text so far. This code example will print out the text “fieldValue = The Private Value”, which is the value of the private field privateString of the PrivateObject instance created at the beginning of the code sample. Notice the use of the method PrivateObject.class.getDeclaredField("privateString"). It is this method call that returns the private field. This method only returns fields declared in that particular class, not fields declared in any superclasses. Notice the line in bold too. By calling Field.setAcessible(true) you turn off the access checks for this particular Field instance, for reflection only. Now you can access it even if it is private, protected or package scope, even if the caller is not part of those scopes. You still can’t access the field using normal code. The compiler won’t allow it. This code example will print out the text “returnValue = The Private Value”, which is the value returned by the method getPrivateString() when invoked on the PrivateObject instance created at the beginning of the code sample. Notice the use of the methodPrivateObject.class.getDeclaredMethod("privateString"). It is this method call that returns the private method. This method only returns methods declared in that particular class, not methods declared in any superclasses. Notice the line in bold too. By calling Method.setAcessible(true) you turn off the access checks for this particular Method instance, for reflection only. Now you can access it even if it is private, protected or package scope, even if the caller is not part of those scopes. You still can’t access the method using normal code. The compiler won’t allow it. Reflection is a feature in the Java programming language. It allows an executing Java program to examine or “introspect” upon itself, and manipulate internal properties of the program. For example, it’s possible for a Java class to obtain the names of all its members and display them. The ability to examine and manipulate a Java class from within itself may not sound like very much, but in other programming languages this feature simply doesn’t exist. For example, there is no way in a Pascal, C, or C++ program to obtain information about the functions defined within that program. One tangible use of reflection is in JavaBeans, where software components can be manipulated visually via a builder tool. The tool uses reflection to obtain the properties of Java components (classes) as they are dynamically loaded. That is, the method names of class java.util.Stack are listed, along with their fully qualified parameter and return types. This program loads the specified class using class.forName, and then calls getDeclaredMethods to retrieve the list of methods defined in the class. java.lang.reflect.Method is a class representing a single class method. The reflection classes, such as Method, are found in java.lang.reflect. There are three steps that must be followed to use these classes. The first step is to obtain a java.lang.Class object for the class that you want to manipulate. java.lang.Class is used to represent classes and interfaces in a running Java program. to obtain Class information on fundamental types. The latter approach accesses the predefined TYPE field of the wrapper (such as Integer) for the fundamental type. The second step is to call a method such as getDeclaredMethods, to get a list of all the methods declared by the class. will display a textual representation of the first method declared in String. In the examples below, the three steps are combined to present self contained illustrations of how to tackle specific applications using reflection. In this example, a Class object for A is created, and then class instance objects are checked to see whether they are instances of A. Integer(37) is not, but new A() is. The program first gets the Class description for method1, and then calls getDeclaredMethods to retrieve a list of Method objects, one for each method defined in the class. These include public, protected, package, and private methods. If you use getMethods in the program instead of getDeclaredMethods, you can also obtain information for inherited methods. Once a list of the Method objects has been obtained, it’s simply a matter of displaying the information on parameter types, exception types, and the return type for each method. Each of these types, whether they are fundamental or class types, is in turn represented by a Class descriptor. There is no return-type information retrieved in this example, because constructors don’t really have a true return type. As with methods, it’s possible to obtain information about just the fields declared in a class (getDeclaredFields), or to also get information about fields defined in superclasses (getFields). So far the examples that have been presented all relate to obtaining class information. But it’s also possible to use reflection in other ways, for example to invoke a method of a specified name. Suppose that a program wants to invoke the add method, but doesn’t know this until execution time. That is, the name of the method is specified during execution (this might be done by a JavaBeans development environment, for example). The above program shows a way of doing this. getMethod is used to find a method in the class that has two integer parameter types and that has the appropriate name. Once this method has been found and captured into a Method object, it is invoked upon an object instance of the appropriate type. To invoke a method, a parameter list must be constructed, with the fundamental integer values 37 and 47 wrapped in Integer objects. The return value (84) is also wrapped in an Integer object. which finds a constructor that handles the specified parameter types and invokes it, to create a new instance of the object. The value of this approach is that it’s purely dynamic, with constructor lookup and invocation at execution time, rather than at compilation time. In this example, the d field has its value set to 12.34. One final use of reflection is in creating and manipulating arrays. Arrays in the Java language are a specialized type of class, and an array reference can be assigned to an Object reference. This example creates a 10-long array of Strings, and then sets location 5 in the array to a string value. The value is retrieved and displayed. This example creates a 5 x 10 x 15 array of ints, and then proceeds to set location  in the array to the value 37. Note here that a multi-dimensional array is actually an array of arrays, so that, for example, after the first Array.get, the result in arrobj is a 10 x 15 array. This is peeled back once again to obtain a 15-long array, and the 10th slot in that array is set using Array.setInt. Note that the type of array that is created is dynamic, and does not have to be known at compile time. Java reflection is useful because it supports dynamic retrieval of information about classes and data structures by name, and allows for their manipulation within an executing Java program. This feature is extremely powerful and has no equivalent in other conventional languages such as C, C++, Fortran, or Pascal. Glen McCluskey has focused on programming languages since 1988. He consults in the areas of Java and C++ performance, testing, and technical documentation. 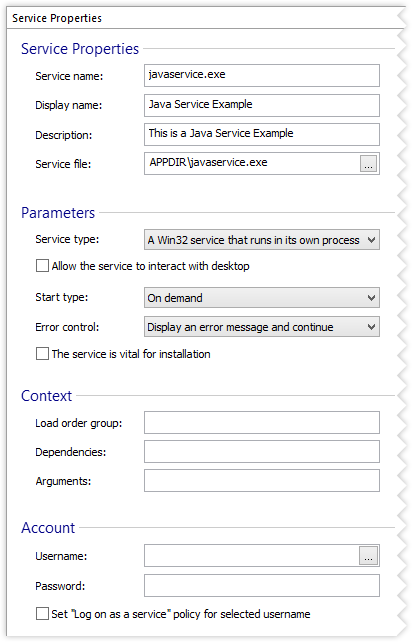 Let’s say that we want to create a Windows Installer package for the included Java Service example. This tutorial will present in detail how to achieve this goal. In order to replicate it on your own machine, you need to have a (latest) Sun JDK installed. Before you start the tutorial download and unzip the Java Service Example. It contains all the files necessary to accomplish this tutorial. The main() method will be called when the service starts and the stop() method will be called when service must stop or the computer is shutting down. Start Advanced Installer by selecting it from the “Start” menu. Launching Advanced Installer automatically starts a new installation project. Choose “Java” > “Java Application” as the project type. A good idea is to save and name the project at this point. Use the “Save” menu item under the “File” menu or the Ctrl+S keyboard shortcut and let’s name it javaserviceexample.aip. Please note that these details are completely fictive. Get to the Install Parameters page by clicking “Install Parameters” on the left side page menu. We won’t change anything here, leaving everything to their default values. Go to the Files and Folders page by clicking on “Files and Folders” on the left side page menu. Right click “Application Folder” and select “Add Files”. Browse to where you unzipped the Java Service example then go to the lib folder and select the Java Services example jar archive “javaservice.jar”. Click Ok.
Go to the Java Products page by clicking on “Java Products” on the left side page menu. Create a new [ Java Product ] by clicking on the New Product toolbar button. Let’s call it javaservice. Click on the [ Add JAR(s)… ] button and browse to and select the javaservice.jar file. 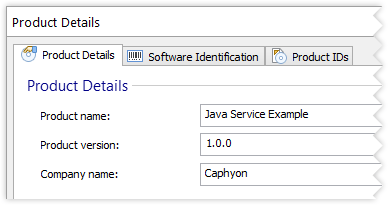 Click Ok.
Edit the Main class to: com.caphyon.service.JavaService. At the application type select “Win32 Service”. Now a new file has appeared in the Files and Folders Page: javaservice.exe. If the service terminates unexpectedly from time to time or when the user logs off, the Java Virtual Machine may receive incorrect signals. This can be fixed by using the Reduced usage of operating-system signals (-Xrs) option in the Edit JVM Parameters dialog (it can be launched from the Virtual Machine tab). Go to the Services page by clicking on “Services” in the Project Details. Click on “Services to Install” and select “New Service Installation”. 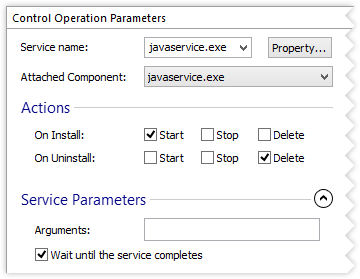 In the “Choose Instalation Dialog” click on “Application Folder” and select “javaservice.exe”. 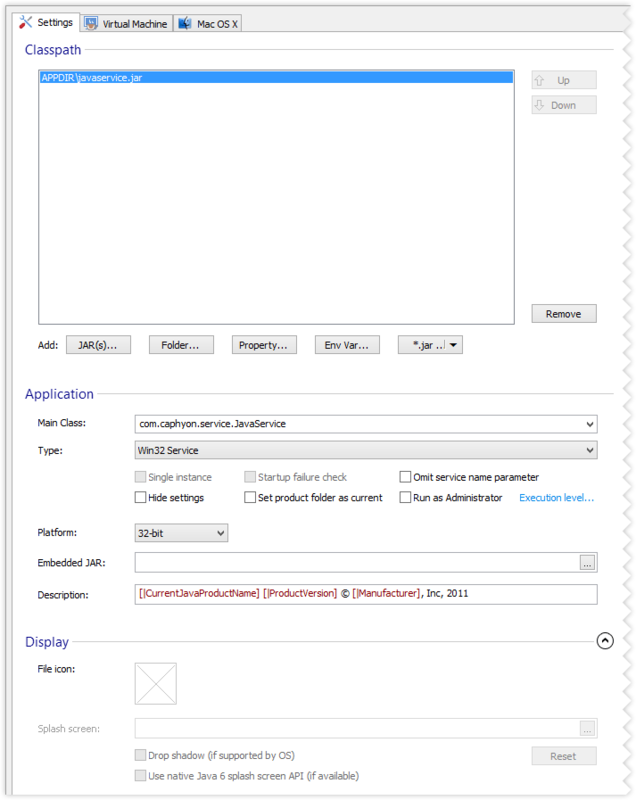 Edit the Display Name: Java Service Example. Edit the Description: This a Java Service Example. Leave the Service Parameters, Service context and Service Account unchanged. Right click on “Control Action” and select “New Service Operation”. Edit the Service Name to: javaservice.exe. Click on the [ Build ] toolbar button. Click on the [ Run ] toolbar button to run and test the MSI you created. After installation you should have a new service installed. You also can build Java Service Example msi package using ant. Open a console window and change current directory to the directory where you unzipped the Java Service example archive. Execute the following command: ant msi. To remove the installed package, simply Run it again and select Remove. That’s it!